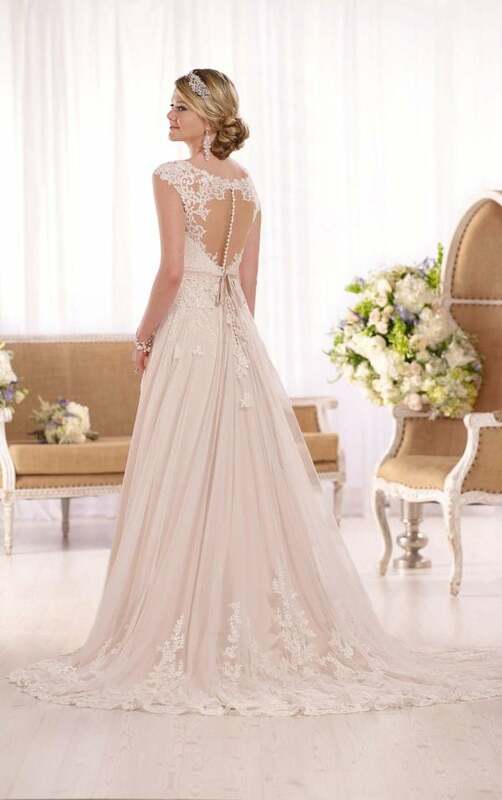 This gorgeous lace over matte-side Lustre satin A-line wedding gown from Essense of Australia features sparkling beading, a head turning illusion back, and elegant cap sleeves in lace. A 1/2″ grosgrain ribbon belt accentuates the waist, while the fitted bodice and sweetheart neckline frame the face. Available in a myriad of dress colors, this dress zips up under matching fabric-covered buttons. This classically elegant lace and tulle A-line wedding dress from Essense of Australia features gorgeous beaded lace throughout its fitted bodice and voluminous tulle skirt. 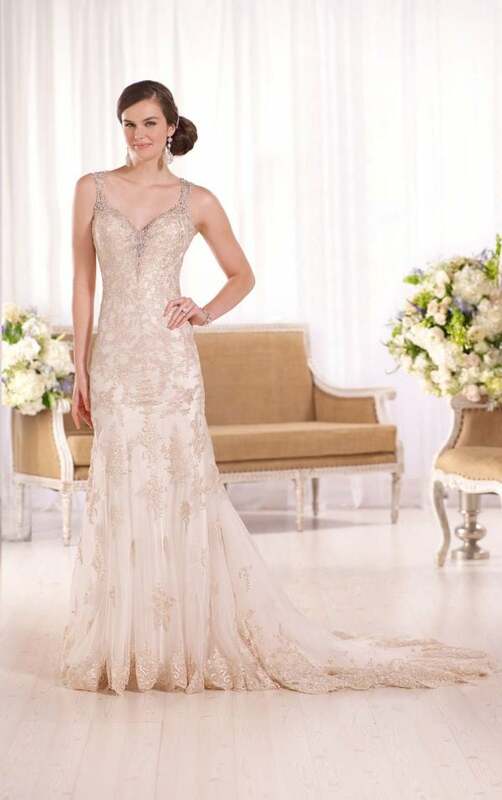 The beaded waist detailing slims the body, while the strapless, sweetheart bodice frames the face. This exquisite Diamante-beaded lace and tulle modified fit-and-flare silhouette from Essense of Australia boasts beautiful cap lace sleeves and peek-a-boo back detailing. The back zips up under matching crystal buttons. This stunning wedding gown from Essense of Australia features elaborate patterned lace over a rich Imperial crepe spaghetti strap sheath gown. Curve-hugging linear lace on a plunging bodice make this stunning fit-and-flare wedding dress from Essense of Australia a top pick for the perfect wedding. Diamante embellishments sparkle from front to back on the figure-flattering waist band. The ethereal tulle skirt falls perfectly to the floor, extending into a breathtaking train. Choose from a corset closure or zipper closure under fabric-covered buttons. Dress available in romantic ivory and traditional white. 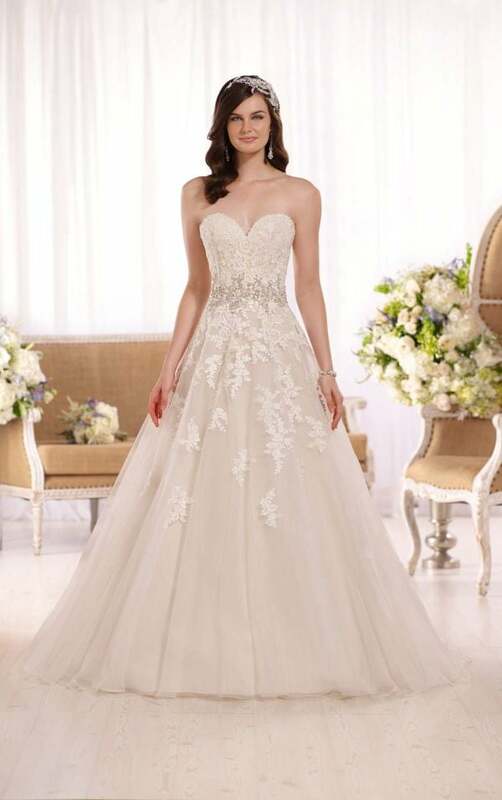 This gorgeous fit-and-flare strapless lace over Dolce satin designer wedding gown from Essense of Australia comes with your choice of a lined or unlined corset-style bodice. The voluminous skirt flows into a long train, and the back zips up under fabric-covered buttons. These stunning shoes are a bridal classic very popular and very high quality very nice with smart dresses for nights out and posh do's perfect round peep toe for that elegant look and made to high quality. This opulent designer lace over matte-side Lavish satin sheath wedding gown from Essense of Australia features hand-sewn Diamante beading, lace shoulder straps, and a breathtaking lace-illusion keyhole back. 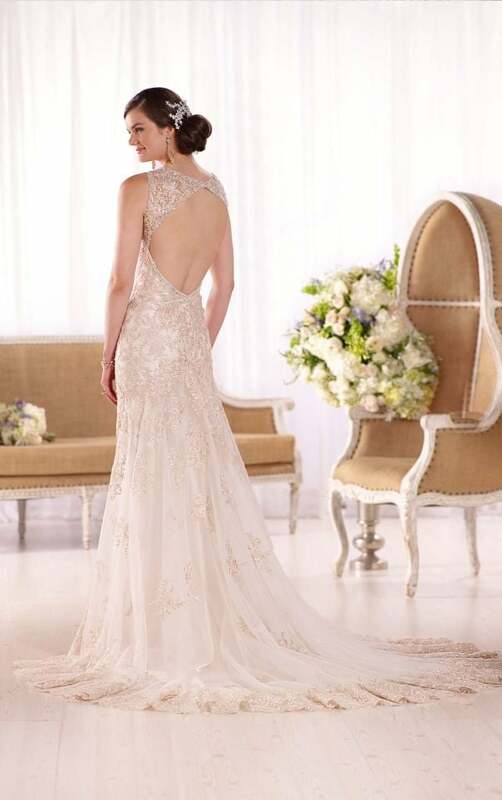 The back of the wedding dress provides an ease-of-use zip-up feature hidden under sparkling crystal buttons. 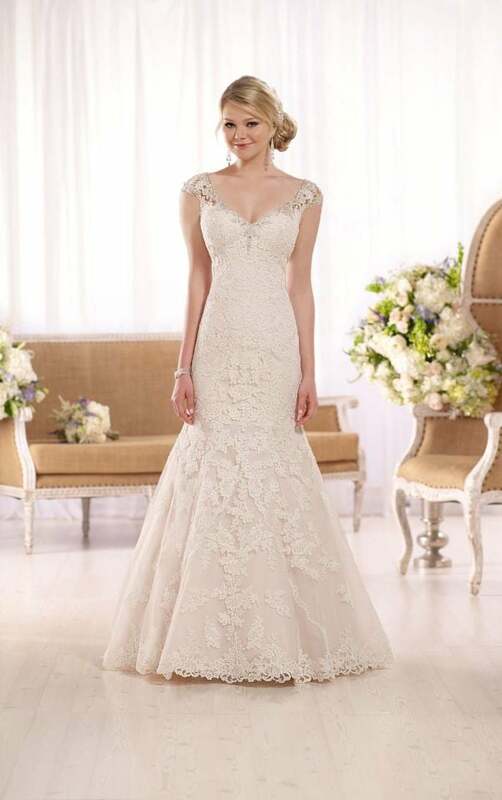 This exquisite embroidered knee-length wedding gown from Essense of Australia is made from gorgeous lace on tulle, and features a pretty lace illusion neckline and back. A Diamante-encrusted band slims the waist, and the back zips up under coordinating fabric-covered buttons. Stunning ivory or white satin heels, perfect for your big day featuring closed toe and gorgeous satin bow on the heel. #D2103 - Knee-Length Tulle Wedding Gown. Channeling the chic tea-length skirt fashions of the past, this Essense of Australia tulle wedding dress features hand-sewn lace detailing, a beaded 1.5″ grosgrain ribbon belt, off-the-shoulder illusion straps, and an amazing tea-length skirt. The back zips up under crystal buttons, putting the finishing touch on a short wedding dress that will finally give those amazing wedding shoes the attention they deserve!